Official name: Democratic Socialist Republic of Sri Lanka (Sri Lanka Prajatantrika Samajavadi Janarajaya). The name Sri Lanka was adopted in 1972, before which was used Ceylon  originally a Portugese transcription for the old Pali name Sihala. 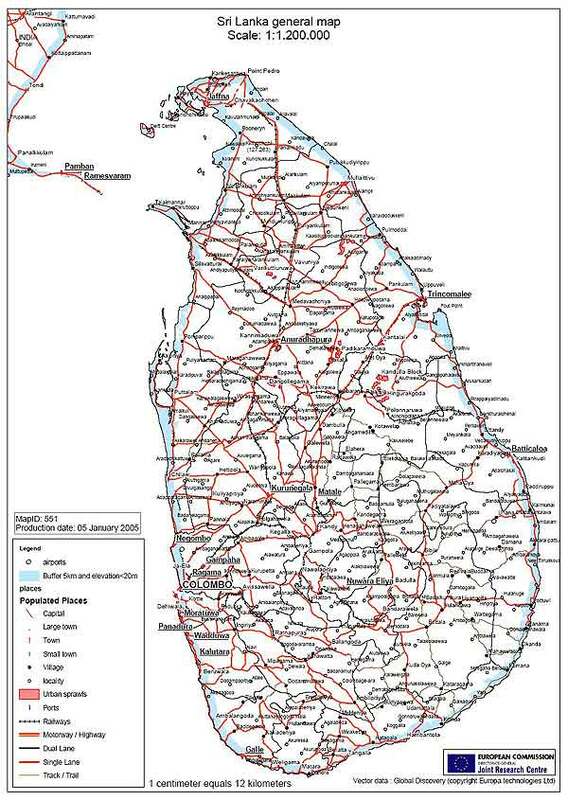 Administration: The country is divided in eight provinces; Central, North Central, North Eastern, North Western, Sabaragamuwa, Southern, Uva and Western. Population:20,926,315 (2007 est.). The 13th Census of Population and Housing of Sri Lanka on 17th July 2001 could not be completed in the northern and eastern parts of the country, but regional statistics are available. An estimation for the whole country was however made – 18,73 Million. Population growth rate: 0.982 p.c. (est. 2007). GDP per capita:4,700 US-dollars (est. 2006). Ethnic groups: Sinhalese 73,96 p.c, Lankan tamils 12,71 p.c, Indian tamils 5,52 p.c, Lankan moors 7,07 p.c. Others, including Burghers and Eurasians, 0,76 p.c. Religious groups: Buddhism 69,30 p.c, Hindus 15,48 p.c, Muslims 7,61 p.c, Christians 7,55 p.c, Others 0,06 p.c. National flag:Adopted in 1951. It depicts alion with sword on red bottom. The lion was the mythical ancestor of the Sinhalese people (sinha means lion). In the corners are found four leaves from the Bo-tree under which Lord Buddha sat. On the left side are found two stripes, one orange and one green, symbolizing the Hindu and Muslim minorities respectively. State emblem:The present republican emblem was adopted in 1972, depicting a Lion with Sword in its right fore paw encircled with a Palapethi open petal design top. In addition it also portrays the Punkalasa, dhammachakka, sun, moon and two sheaves of paddy. National anthem:Namo Namo Matha, in sinhalese language, composed by Ananda Samarakone, chosen as the national anthem on 22 November 1951. More information. Languages: Sinhalese and Tamil are both national languages. English is widely used as a link language. The holy scriptures of Buddhism are written in Pali, whereas the Hindu holy scriptures are written in Sanskrit. Sinhalese developed out of a North Indian Prakrit language in the 9th Century A.D. Sinhalese, Prakrit, Sanskrit and Pali all belong to the Indo-European linguistic family, whereas Tamil is a Dravidian language. President: Mahinda Rajapakshe (Sri Lanka Freedom Party), since 19 November 2005 (photo to the left). He was previously for one and a half years , April 04 – Nov. 05, Prime Minister of country. President Rajapakse’s personal web page. Mahinda Rajapakse was re-elected President in the presidential elections that took place on January 26th, 2010. After 1978 the office of president has had a strong executive function in Sri Lanka. The president is Chief of State as well as Head of the Government and besides Chief Commander of the Armed Forces; whereas the office of Prime Minister is a less important position. Between 1994 and 2005 the President of Sri Lanka was Chandrika Kumaratunga Bandaranaike (Sri Lanka Freedom Party  SLFP), photo to the right. She belongs to one of the most renowned political families of the country. Both her father S W R D Bandaranike (murdered in 1959) and her mother Sirimavo Bandaranaike (who passed away in the year 2000) were Prime Ministers. She led the coalition Peoples' Alliance (PA), in which SLFP is the major party, which ruled Sri Lanka till it was defeated by the UNP in the elections on 6 December, 2001. Local Government elections were held in late March 2006. The coalition led by President Mahinda Rajapakse won 222 of 266 local councils. The main opposition group won 32 councils, and minor parties 10. Analysts said, the overwhelming victory is sign for endorsement of the president's negotiations with the LTTE. The election in the North and East of the island was not held and put off until September for security reasons. Parliament: Parliamentary elections for the 13th Parliament of the Democratic Socialist Republic of Sri Lankawere held on 2 April 2004. The parliament has 225 seats, out of which 196 members are elected in multi-seat constituencies and 29 by nationwide proportional representation. Illankai Tamil Arasu Kachchi, ITAK (Tamil National Alliance), 22 seats. Prime Minister since 21 November 2005: Ratnasiri Wickramanayake. Leader of the Opposition: Ranil Wickremesinghe (United National Party, UNP). Wickremesinghe became Prime Minister on 9 December 2001 after his party’s victory in the general elections that year, but had to resign efter the was defeat in the elections of April 2004. History: Historical time, i e the period during which events have been recorded, goes back to 250 BC. At that time there were both Prakrit and Tamil speaking peoples living on the island, which both had moved from the Indian mainland. The native people of the island were the Veddahs. 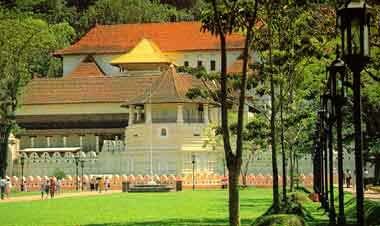 Up to the 19th Century AD several dynastic states were created in Anuradhapura, Rohana, Polonnaruva, Jaffna, Dambadeniya, Gampola, Kotte, Sitavaka and Nuvara (Kandy). The Portugese began to colonize the coastal areas from 1594, the Dutch from 1640 and finally the Brittish from 1795. Neither the Portugese nor the Dutch managed to conquer the highlands where the Sinhala king ruled at Nuvara. But in 1815 the Brittish defeated his army and the monarchy was abolished. In 1833 all the areas of the island were united into a centralized colonial adminstration, which ruled the island till Independence in 1948. The Library of Congress, USA, offers through its Country Studies Web site detailed Information on all Aspects of Countries round the Globe. Look for Sri Lanka. Information contained in the Country Studies On-Line is not copyrighted and thus is available for free and unrestricted use by researchers. As a courtesy, however, appropriate credit should be given to the series. Unfortunately, though, the information on Sri Lanka is not updated since October 1988. World Bank Group/Sri Lanka: Data reports, statistics, projects etc, for Sri Lanka, including its country report from 2002, Sri Lanka: Recapturing Missed Opportunities. The Swedish Government’s Division for Democratic Issues, based at the Ministry of Justice, regularly publishes reports about the human rights situation in countries all over the World. Read the 2007 Report on the Human Rights Situation in Sri Lanka (in Swedish only).